Should we trust this man’s predictions? Uh . . . No! 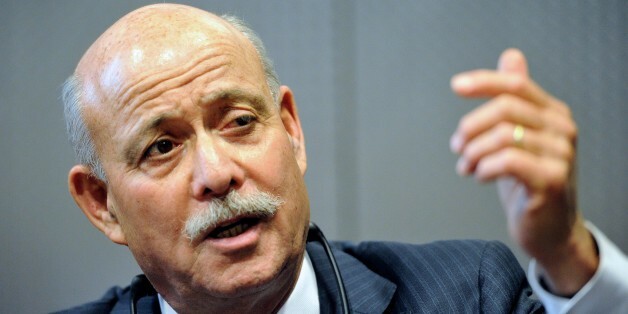 Rifkin’s promoters and defenders will tell you that he’s advised leaders in the European Commission and China, that he’s lectured at the Wharton School’s Executive Education program since the mid-1990s, and that he has won many plaudits, especially from the business press. Some of these honors and achievements aren't so clear or are hard to verify, however. 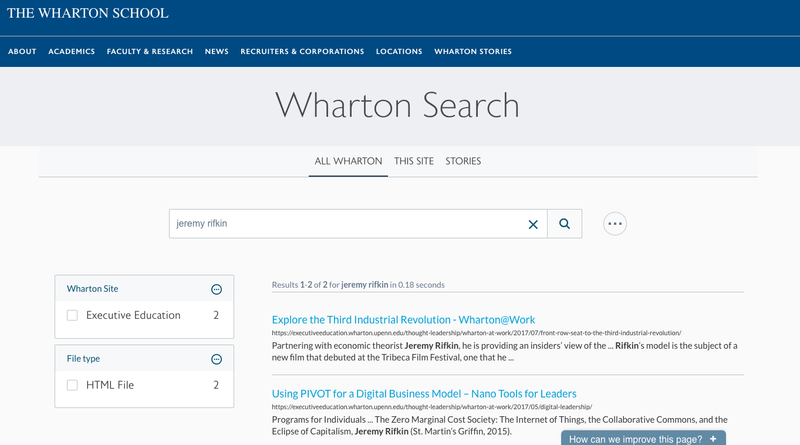 For instance, a Google search for "Jeremy Rifkin Wharton" produced only one link to the actual Wharton school in the first two pages of results, and that Wharton page does not list Rifkin as a lecturer there. The rest of the hits on the first two pages were examples where Rifkin or others, including Virginia Tech, were promoting his connection to the Wharton. (I had two friends run the Google search I make sure it wasn't my browser - they found the same thing.) For some strange reason, the Wharton school is more central to Rifkin's promoted image than Rifkin is to Wharton's. And oddly, searching for Rifkin on the Wharton School’s webpage produces only two hits — neither of which has to do with him being a lecturer there. (I paste a screenshot below by way of evidence.) Other “accomplishments” are equally unclear and hard to substantiate. When we peer behind such promotional imagery, however, things become even murkier. And when we review Rifkin’s writing career, it’s not clear why anyone would want to use his ideas to inform their plans. Over time, Rifkin’s writings came increasingly to focus on predicting future technological trends, which, he claimed again and again, would be drastic and lead to the overturning of existing society. Rifkin became a techno-prophet. There’s no cutting-edge social science behind Rifkin’s prognostications: each book involves him looking at current trends, often cherry-picking evidence to make looming change look the most dramatic, and then projecting forward to some imagined future, typically taking potential changes to their logical extreme. In other words, Rifkin riffs — often erroneously. In 1992, Rifkin published Beyond Beef, a screed on the environmental costs of beef consumption. Beyond Beef was subtitled The Rise and Fall of Cattle Culture, and Rifkin pushed for a 50% decrease in beef consumption. While Rifkin’s activism was laudable — beef really is bad for the environment — cattle culture has not fallen. On a global level, beef consumption has actually increased, particularly in China. In The End of Work: The Decline of the Global Labor Force and the Dawn of the Post-Market Era (1996), Rifkin argued that “new, more sophisticated technologies are going to bring civilization ever closer to a near-workerless world.” While economists continue to debate the relationship between technology and employment — and while we are once again going through a moment of concern that “robots” or “AI” are “taking people’s jobs” — the plain fact is that work has not ended in any significant way in the 23 years since Rifkin’s book. Part of the issue, which Robert Gordon described in his book The Rise and Fall of American Growth, is that the US went through a period of computer-driven growth in the 1990s, but those productivity gains slowed in the early 2000s. And in general, computers and other digital technologies have not fulfilled the productivity fantasies of their most ardent promoters. Digital technologies certainly haven’t led to the massive joblessness that Rifkin predicted in his book. In 2002, Rifkin put out The Hydrogen Economy: The Creation of the Worldwide Energy Web and the Redistribution of Power on Earth. Rifkin’s webpage puts it like this: “In The Hydrogen Economy, best-selling author Jeremy Rifkin takes us on an eye-opening journey into the next great commercial era in history. He envisions the dawn of a new economy powered by hydrogen that will fundamentally change the nature of our market, political and social institutions, just as coal and steam power did at the beginning of the industrial age.” At about the time of Rifkin’s book, the idea of a hydrogen economy was a darling pet of President George W Bush, who discontinued Clinton and Gore’s SuperCar program and began his own research program, named FreedomCar, to create hydrogen vehicles. Seven years later, President Barack Obama’s Secretary of Energy Steven Chu — a Nobel Prize-winning physicist — effectively killed the FreedomCar program, which had not made a great deal of progress. Chu argued that the hydrogen economy was not a near or even medium term possibility and that the government would be better off focusing on viable technologies. Since that time, while hydrogen energy still has its proponents, some of them cultish, few argue that ubiquitous hydrogen power is laying anywhere near the horizon. The title of Rifkin’s 2004 book, The European Dream: How Europe’s Vision of the Future is Quietly Eclipsing the American Dream, nicely lays out a thesis, but we might be forgiven for asking how that “European dream” is going right now with Greece, other financial crises, and the politics of austerity; with the refugee crisis and the attendant rise of right-wing and populist politics; with Brexit; with worries that Europe is once again heading into a recession and fears that the Eurozone may eventually fall to pieces. In The Empathic Civilization: The Race to Global Consciousness in a World of Crisis (2010), Rifkin stated that “the biological and and cognitive sciences” had come to the “dawning realization that we are a fundamentally empathic species,” which “has profound and far reaching consequences for society.” Furthermore, our glorious hard-wired empathy would combine with “new communication revolutions,” especially the Internet, to set us the “current race to global peak empathy.” (There’s a chapter titled “The Climb to Global Peak Empathy.” I kid you not.) Now, of course, we are talking about “tribalism” and how Russian troll farms exacerbated social divisions in the United States, especially around race and other hot-button issues, to manipulate elections. And nationalism and anti-immigrant sentiments have reared their nasty heads in several nations around the globe. Some peak empathy! In his 2011 book, The Third Industrial Revolution, Rifkin argued that “the traditional, hierarchical organization of economic and political power will give way to lateral power organized nodally across society.” Meanwhile, economic centralization has actually increased in some sectors with big companies getting bigger, and people worry about the potential monopoly power of firms like Facebook, Amazon, and Google, which regularly hoover up promising start-ups that might threaten their position, thereby further increasing their power. And, again, nationalism has made a comeback. Traditional political power ain’t looking too threatened. Most recently, in 2014’s The Zero Marginal Cost Society: The Internet of Things, the Collaborative Commons, and the Eclipse of Capitalism, Rifkin writes, “But what if I were to say to you that 25 years from now, the bulk of the energy you use to heat your home and run your appliances, power your business, drive your vehicle, and operate every part of the global economy will be free?” While I can’t say that this is an inaccurate prediction because the time has not yet elapsed, it’s also true that none of the many engineers and economists who focus on energy that I know or read are making predictions like this. Who wants to wager ? My bet is that Rifkin’s energy dream ain’t gonna happen. So, a lot of what Rifkin says is untrue. This webpage, which rounds up criticisms of Rifkin, lays out at least seven more examples where his forecasts badly missed their mark. Rifkin’s predictions about economics and technology regularly fail. If we step back, we see that Rifkin fits the long Western tradition of millenial, or apocalyptic, thinking that ultimately stems from the Judeo-Christian tradition. There have been plenty of millenial techno-prophets over the last few hundred years. Ray Kurzweil, for instance, sermonizes about the singularity, the moment when computers will become hyper-intelligent surpassing their human masters, and the universe will enter a forever of technological bliss. Kurzweil’s predictions haven’t held up very well either. As I have written about in a forthcoming piece, humans are truly terrible at predicting future technological trends, as studies have shown again and again. For instance, the technology consultant Jeffrey Funk published an article demonstrating that the famed MIT Technology Review typically fails when it comes to technology prediction. Among other things, Funk found that only four of the forty technologies chosen by Technology Review as “breakthrough technologies” between 2001 and 2005 have sales greater than $10 billion, while eight technologies not predicted by the magazine have sales of that volume. The dangers of, say, basing university plans on the kinds of techno-prophecies Rifkin pushes should be clear. Imagine that you headed a department of meat science, bought into the predictions in Beyond Beef in 1992 and stopped teaching your students about cows. Imagine you headed a college of engineering and decided to go all in on the hydrogen economy at the expense of other energy types. Making choices on the bases of such prophecy is folly. Furthermore, individuals who dig in their heels and say, "No! This time Rifkin is right!" about the “zero marginal cost society” or whatever need to face the fact that they believe so not because they have any great insights into the future but because they share Rifkin’s prejudices — probably because they've been reading the same pieces of hype-filled journalism he has. Most problematically, Rifkin's assertions — that the future will be radically different technologically in ways he can foresee — play into the hands of higher education reformers who push "21st century skills," Design Thinking, the idea that scientists and engineers need training in "creativity" (any evidence that they weren't creative before? ), and other academic fashions that are, by and large, unsubstantiated hogswallop. University curricula have always evolved to deal with changing social, economic and technological realities, and there's no reason to believe curricula and programs need some major systematic overhaul, certainly not in the name of some fad or some vision of the future that is probably wrong. At the risk of offending my elders, it seems to me that the embrace of Rifkin at Virginia Tech points to a deeper, more depressing, and sadder reality: While many quarters of our society push for increasing public understanding of science and engineering, it is just as true that we need to increase public understanding of society, including economics and the social dimensions of technology. Individuals not trained to to think about the economics, sociology, and history of technology and society are being asked to make decisions related to these topics— and in a nice little demonstration of the Dunning-Kruger effect, they overestimate their own capabilities and do not realize how much they don’t know. If university leaders don’t approach the relationship between education and social, technological, and economic change with more intellectual seriousness, rigor, and sobriety, they could set us on a very bad path indeed.